The newspapers and media are full of stories about Alzheimer’s and how it will impact the country over the next several decades as Baby Boomers age. There are currently five million Americans living with Alzheimer’s and officials expect that to grow to 16 million by 2050. A woman faces a one-in-six lifetime risk of developing Alzheimer’s. This is nearly double her risk of developing breast cancer. Alzheimer Disease (also known as AD) is a form of dementia. Other types of dementia can be caused by brain injury, stroke, and other medical incidents or diseases. Although not all forms of dementia are Alzheimer’s, I will sometimes use the terms interchangeably since many of the symptoms and behaviors are similar. Every Alzheimer’s story is different because every patient and every caregiver is different. God didn’t use cookie cutters to create us, but there are similarities that, when shared, can be helpful to others who are dealing with the effects of the disease on their loved one. My mother-in-law had always been very independent—a ranch wife who, in her sixties, cared for her much older husband who, ironically, had Alzheimer’s. She has often commented that she quilted, tole-painted, and did scrapbooking “to keep my sanity” during those difficult years of caring for her husband. After his death, she worked as a church secretary, organized the Operation Christmas Child drive for their church every year, and was active in the women’s group and at the local senior center, as well. Then one of my mother-in-law’s friends first alerted us that she was concerned about Mom. Mom had quit her job at the church and didn’t seem to want to go out with her friends anymore. She angered easily. Sometimes she wouldn’t respond to phone calls or answer the door. We began noticing that Mom was losing weight—she went from a Size 16 to a Size 8 in just a few months. Although she had plenty of easy-to-prepare food available, it stayed on the shelf and in the freezer while food spoiled in her fridge. Yet she would tell us that she was eating three meals a day. My brother-in-law and his wife began monitoring her more carefully, making the thirty-mile roundtrips several times a week. They discovered that she wasn’t taking her medications properly, selecting one from the Tuesday morning section of her pill case and another from the Friday evening compartment. Mom not only forgot to pay her bills on time, but she placed the invoices in strange places, making it difficult for her son to help her. Eventually, he persuaded her to sign the paperwork at the bank so he could write checks for her. At his request, her physician did an in-office mental evaluation which pointed to Alzheimer’s. Memory loss that disrupts daily life, evidenced by her not eating. Challenges in planning or solving problems, such as not keeping up with her bills. Difficulty completing familiar tasks at home, work, or leisure. Her house and garden were no longer beautifully tended although physically she remained strong and healthy. Confusion with time or place. She would forget that we were coming to see her. Trouble understanding visual images and spatial relationships. She had (thankfully!) voluntarily given up driving. New problems with words in speaking or writing. We had many circular conversations with her during this time. Misplacing things and losing the ability to retrace steps, confirmed by the misplaced bills. Decreased or poor judgment. She refused to euthanize her incontinent house cat that was causing very unsanitary living conditions. Withdrawal from work or social activities, evidenced by hiding when someone came to the door and abandoning her clubs and church activities. Changes in mood and personality. She went from being an active, outgoing woman, to sitting alone in her house and crying all day, accusing people of spying on her through hidden cameras. These are all common early signs of dementia. Not everyone who suffers memory loss will exhibit all of these signs, but if you observe them in your loved one, contact her doctor for an accurate diagnosis. As we age, some of us wonder whether our own forgetfulness is a sign of Alzheimer’s or if it is simply typical age-related change. This link for the above list has excellent (and reassuring!) information for telling the difference. Their website has many resources and helpful articles on all types of dementia. If you suspect your loved one may be facing some type of dementia, spend some time on this site. 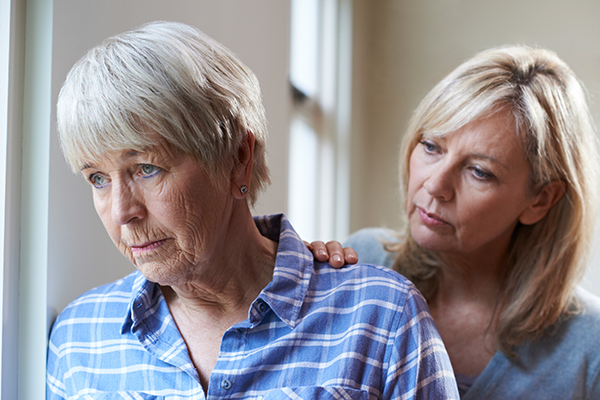 In our next article, we will address some of the issues you may face when caring for a loved one with memory loss. © 2017 by Marcia K. Washburn who writes from her home in Colorado. Through the years, Marcia has cared for four adult relatives in her home and presently cares for her mother-in-law who has Alzheimer Disease. Marcia is the Assistant Director of Christian Family Eldercare. Her most recent book, Home-Based Eldercare: Stories and Strategies for Caregivers, is available at ChristianFamilyEldercare.org.